* Extra Heavy Body and very opaque. * Dries to the hardness of stone. It can be sanded or carved when thoroughly dry. * Adheres to any non-oily, absorbent surface. * Drying too quickly causes mud cracking that is usually cosmetic, not structural. * When mixed with acrylic colors will act as a weak tinting white, while increasing thickness and rigidity. * Excellent substrate for acrylic paint, oil paint, oil pastel, oil bars, watercolor, graphite or dry pastel. * Apply with knife, brush, cake decorating tools, etc. * To prevent shrinkage cracks (mud cracking), dry slowly by covering loosely with plastic wrap. Apply less than 1/4 thick. * Mix with acrylic colors to produce a colored tinted paste. * When dry, Acrylic Modeling Paste may be painted with acrylic or oil colors. * Sculptural: Apply in thin layers allowing each layer to dry before applying next layer. If cracks appear, allow to dry and fill in with additional thin layer of Acrylic Modeling Paste. * Rigid support: Use straight from container. * Flexible support: Mix Acrylic Modeling Paste 50/50 with Gloss Gel Medium, Matte Gel Medium, Gloss Heavy Gel Medium, or Super Heavy Gel Medium. * Ground: Apply a thin layer of Acrylic Modeling Paste to rigid surface (i.e. wood), using a palette knife, trowel or roller. Let dry, then sand smooth. Repeat if necessary. 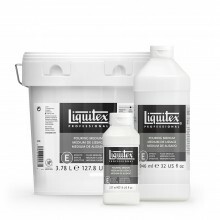 * Absorbent ground: Mix 1 part Acrylic Modeling Paste with 3 parts Liquitex Acrylic Gesso. Apply with trowel or roller. Let dry, then sand smooth. Repeat if necessary. * Paper-Mach: Mix Acrylic Modeling Paste 50/50 with Liquitex Gloss Gel Medium, Matte Gel Medium or Gloss Heavy Gel Medium. Soak paper in this mixture.